Belonging to the same family as rhinoceros, tapir are odd toed ungulates, with four toes at the front and three at the back. These large mammals live in the forests of South America. What sets them apart is their long nose. 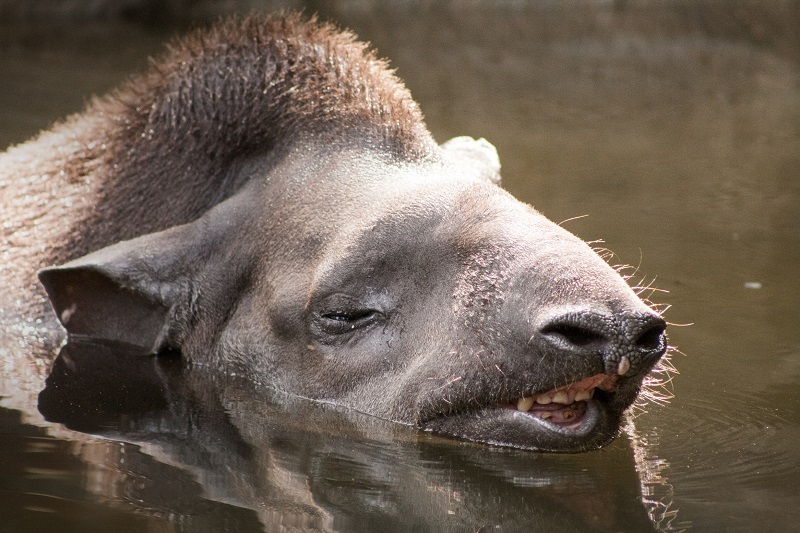 Tapirs have a fleshy, prehensile trunk, which can be used to grab leaves or act as a snorkel if they are swimming. Lowland Tapir (also known as Brazilian or South American Tapir) have a muscular crest on top of their head on which is a mane that stretches between their forehead and shoulders. This species is coloured dark brown without any obvious markings, although they have paler cheeks, ear tips and throats. All baby tapirs are dark brown with pale stripes and spots that provide good camouflage on the forest floor. All tapir instinctively attempt to escape predation by moving into water and Lowland Tapir are able to stay submerged in deep water long enough to make any predator clinging to its back, let go. Lowland Tapir are strong swimmers and may walk along the bottom of river beds to find food. Tapirs excrete in water when possible and there are two theories for why this might be, excreting in water reduces the animals scent trail on the land, therefore reducing the likelihood of predation, or excreting in water may reduce the attractiveness of the rear-end to biting flies. These shy and mostly docile creatures are semi-nocturnal, meaning they are active at night in the wild. Tapirs make shrill whistles and clicks, shrieking to express pain and snorting to express irritation. The Lowland Tapir range over much of South America. They are rarer in some areas than others, and have even become regionally extinct in places due to persecution. 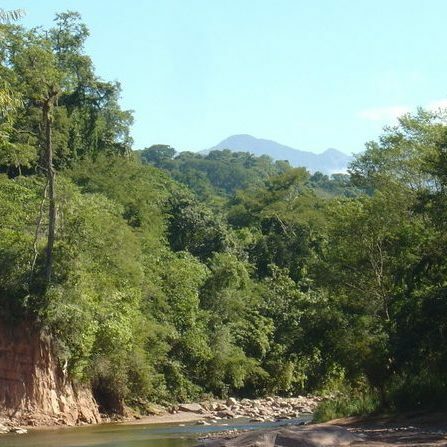 They prefer lowland rainforests ranging from moist swamp forests to grasslands and wetlands, as well as seasonally dry habitats such as the Chaco of Bolivia and Paraguay. The main threats to Lowland Tapir are habitat loss due to deforestation, being hunted for their meat or hides and competition with domestic livestock. Although protected throughout its range and often occurring in protected areas, lack of enforcement can make the laws ineffective. Enforcing hunting restrictions in protected areas and restoring and conserving habitat would help prevent the further decline of the Lowland Tapir. However, this species is decreasing in numbers, more rapidly in some areas than others, despite its wide range. If numbers decrease any further, the species may merit an Endangered classification from IUCN Red List of Threatened Species. Macdonald, D et al (2001) The New Encyclopedia of Mammals. Oxford University Press, Oxford.